The Core i7-980X will essentially replace Intel's current performance king, the 45nm Core i7-975 Extreme Edition. While the Core i7-975 will still be available, the new six-core processor will be offered at the same $999 price point--that's six cores for the price of four! But how much of a difference can two extra cores make? At a glance, the Core i7-975 and the Core i7-980X are identical. Both sport a base clock speed of 3.33GHz, report a TDP rated at 130W, and support three channels of DDR3-1066 memory. But two additional cores means that the processor has 12 threads for an application to work with, versus four cores and 8 threads in the i7-975. You'll also find a 12MB L3 cache shared across all six of those cores, as opposed to the 8MB cache in the i7-975. A processor's cache functions as a memory storage area, where frequently accessed data remains readily accessible. 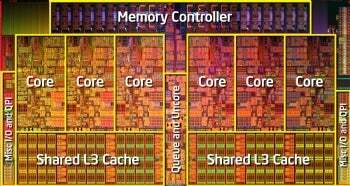 A larger L3 cache shared across all six cores allows data to be exchanged among them far more readily, improving performance in multithreaded applications. With a large cache and four extra virtual threads, you'd expect to find the greatest appreciable performance difference between the two chips in applications designed to take advantage of multiple cores--and our test results reflected as much. For our tests, Intel provided a pair of DX58SO motherboards. Serial upgraders should be pleased to note that the Core i7-980X is compatible with existing X58 chipsets. Just drop it into your existing motherboard, and you're (almost) ready to go; we had to perform a required, but painless, BIOS update. Our second test bed was equipped with the aforementioned Core i7-975 Extreme Edition processor. Both test beds also carried 6GB of RAM, 1TB hard drives, ATI Radeon HD 5870 graphics cards, and optical drives for loading software. We ran all of our tests on Windows 7 Ultimate Edition (64-bit). 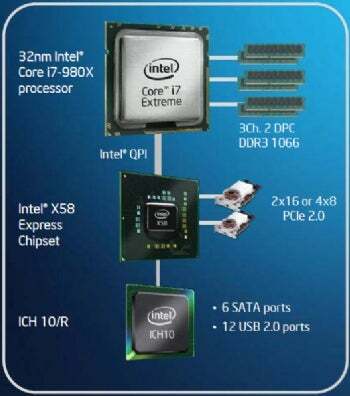 Intel is pitching the Core i7-980X as the the premier part for the enthusiast gaming crowd. In our tests, we did see some improvements over the Core i7-975, but they were marginal. In Unreal Tournament 3 (1920-by-1200 resolution, high settings), the Core i7-980X cranked out 159.9 frames per second as compared to the Core i7-975's 155.4 fps, a 2.8 percent improvement. In Dirt 2, the Core i7-980X offered 73.3 fps, against the Core i7-975's 71.7 fps--a 2.2 percent increase. Those results are hardly surprising. Despite the proliferation of multicore processors, many modern video games have yet to take full advantage of multithreading. Sega's recently released Napoleon: Total War and Ubisoft's upcoming R.U.S.E. have both touted their Core i7-980X optimization, claiming greater detail and realism thanks to simply having more physical cores to work with. Other games boasting optimization for more than four processor threads include Ubisoft's Far Cry 2, Capcom's Resident Evil 5, and Activision's Ghostbusters. That being said, if you recently sprang for a Core i7-975 and are strictly a gamer, there's no need to curse your poor timing--at least, not until more developers fully commit to the multithreaded bandwagon. If, on the other hand, you spend much of your time working with multithreaded applications--including Blender, Adobe Photoshop, and Sony Vegas Pro--coughing up $1000 for your workstation's processor might not necessarily be a bad idea. The most tangible results will be apparent in applications designed to sprawl across as many cores as possible. Take Maxon's Cinema 4D, 3D animation software used by professionals in numerous industries. In Maxon's Cinebench CPU benchmark--which can utilize up to 64 processor threads--the six-core i7-980X saw a 40 percent improvement in performance over the quad-core i7-975. When considering a processor with a 130W TDP, there's a good chance that saving a few bucks on your energy bill isn't your chief concern. Nevertheless, the Core i7-980X does offer perceptible gains over the i7-975. With all power-saving features disabled, power utilization at peak levels for the i7-980X was 210 watts, versus the i7-975's 231 watts. That's a 10 percent difference in what seems like the wrong direction, indicative of the potential power savings of the smaller 32nm process. There's a lot to like here, but that's to be expected--this is a $1000 piece of silicon, after all. As far as gamers are concerned, the i7-980X may not blow the i7-975 out of the water currently, but in this case the performance bottleneck lies in the lack of available multithreaded offerings--a trend that's already begun to change. If this chip is in your price bracket, it's well worth the cost of entry provided that you haven't plunked down for an Extreme Edition processor too recently. And as multicore processors and multicore-optimized applications become increasingly common, you'll be able to put all six of those cores to good use--for work and play.